February 20th /21st Fishery Opening Weekend + the new Lake View Apartment is available to rent. The Midweek Drifters: *New for 2016. Date: Every other Wednesday starting 06/04/2016This is a friendly gathering of anglers meeting at Stocks once a fortnight starting on Wednesday April 6th. Everybody is welcome to join the Midweek Drifters, whether it’s your first time ever boat fishing or whether you are an experienced boatman. It is the perfect chance to fish Stocks with fellow anglers and learn new techniques, patterns, areas, and tactics as the trout’s behaviour and feeding habits change over the course of the season. There is no entry fee for joining the Midweek Drifters and you may come along to as many, or as few, of the gatherings as you like. They are fished between 10am and 4pm to a 3 fish limit (you must take your first two fish but may select your third). There are nibbles and drinks provided at the weighing, a tackle prize for the best basket. Also we will give 15% off everything in our tackle shop for all Drifters on the day. All this for just £30/ angler! You must book your place by Monday evening prior to given Wednesday. The Rio 4s is a four man team event that will see all the teams fishing over three days each separated by roughly one month. Each match will undoubtedly require very different fishing techniques and tactics, so the winning team will have to be adaptable. Ultimately, one of the teams will be crowned the 2016 Rio 4 Champions. Teams of four will fish the first two rounds as two pairs. Each pair will fish together in the same boat to try and complete a bag of ten trout between them. Once they have completed their bag they must return to the lodge to receive a time bonus. They are then free to continue fishing on catch and release, from a drifting boat for the remaining time in the match. All the pairs will be ranked at the end of each match, so each team of four will have two rankings that will be totalled to give them a team score. In the final round all four members will be drawn with members from other teams. Anglers with complete a bag of four fish and then carry on fishing catch and release with each returned fish adding 2lbs onto the bag weight. All anglers will be ranked and team points totalled. After the final match the team that has massed the lowest score will be the 2016 Rio Champions. Each match will be fished to international national rules, with the exception of flies that will be fishery rules. Each team may name between four and seven anglers that will be eligible to represent them over the course of the three rounds. However, the very generous prize fund will be split between all the anglers named in the team. A team of four may add an extra angler at any time prior to the final match, as long as no more than a total seven anglers are used over all three matches. This is a great match that has become a popular annual event. Each pair consists of one boat angler and one bank angler. Those fishing from the bank are drawn with a fellow bank angler and together they are free to roam the reservoir shores and boat partners are drawn as usual. It is fished to fishery rules with regards to flies. Each angler must take their first five fish caught, then crush down their barbs and carry on fishing catch and release. There are generous tackle prizes from GREYS for the top pairs and the top individual angler will also receive the coveted Nigel Haigh Trophy. This is a really friendly affair, if you have not got a partner, but you would like to enter just call the fishery on the number below, tell us whether you would like to fish from boat or bank, and we will sort a partner out for you. It costs just £95.00 per pair to enter and this includes all your fishing fees for the day. Registration is at 9am with a planned start time of 10am. The briefing will be at 9:30, after which the bank anglers will able to set off for their chosen area in readiness to start fishing at 10:00. The match is fished between 10:00am and 5:30pm. The winners will be decided by ranking both the bank anglers and the boat anglers on the number of fish caught and then adding the two rankings for each pair. However, there other good reasons for entering this competition. Where else can you get to fish for in a boat with some of the best fly anglers in the country. I personally have learnt so much from these guys and the experience has been invaluable to me. It’s also a great way to get to know Stocks and to improve your catch rates in future visits. This competition is like no other competition you that will have ever fished! The reservoir is split into five zones which are clearly marked out. The first fish you catch in a zone is worth 5 points, any subsequent fish you catch in that zone is only worth 1 point, so you must try to catch a fish from every zone in order to maximise you scoring. Here’s the hitch! You have been drawn with a boat partner from a rival pair who will try to stop you completing the circuit! Here’s how it works. Initially the control of the engine will go to the angler that was drawn first when the boat draw was done. If your boat partner drew the engine, they can start the competition in any zone of their choice. (The zones do not have to be fished in any particular order). If he/she catches a fish first the control of the engine remains with them and they can move you to another zone where they are fishing for another 5 points. However, if you then catch the first fish in the new zone, then control of the engine comes to you and you may take him/her back to the first zone where you are fishing for 5 points and they (having already caught in this zone) are only fishing for 1 point. This gives you a clear advantage. The control of the engine belongs to the angler that caught the last fish so to keep control you have to keep catching and then you can try to complete the circuit by catching a fish from all the zones. If you manage to catch a fish in all five zones you will have amassed a minimum score of 25 points and will have completed one lap. You may then try to complete a 2nd lap where once again the first fish caught in each zone is worth five points and the same rules apply as in your first lap…….The spirit of this match is to try and amass as many points as you can whilst trying to minimise your rival boat partners score. No hard feelings! These fund raising events are great fun. They are ‘Blind Pairs’ day so you don’t know who your competition partner is until the results are read out at the end of the match. This is how it works. You can either choose your own boat partner to fish with for the day or we will draw you with one. You kill your first four fish for your bag weight and then release up to four more that will each add 2lbs onto your bag weight. At the ‘weigh in’ you will draw a number out of a hat. The person with the corresponding number becomes your partner for competition results. The highest combined total weight of fish will determine the winning pair. Proceeds from any tagged fish caught to be shared with your partner. The aim of the event is to have a fun, friendly day, with the North West Air Ambulance Service being the ultimate winner, gaining much needed funds for a much needed service. The biggest six man team event in the UK a great event. Enter here to qualify for the North of England final. This competition gives value to everyone, with prizes for every heat as well as the final. The format allows a pair of anglers to fish in the same boat. Restrictive rules are kept to a minimum and the competition allows all flies permitted by the fishery. Each pair on first entry will receive a value pack containing relevant and valuable products worth more than the entry fee! There will also be hidden prizes in a proportion of value bags. Multiple entries encouraged. We are very keen to encourage junior participation. Every pair of anglers containing one or more angler under the age of 18 can claim a discount of £10 on first entry. Results are determined on the basis of the pairs total weight, including time bonus where applicable. Individuals may enter as many times as they wish, with different partners at different heats. In addition to the entry fees, competitors will pay the appropriate fee for boats and/or fishing. There will be at least 65 pairs fishing the final on Rutland Water. Qualifications from heats will be on a pro-rota basis. The Lexus European Flyfishing Championships is the biggest Individual Fly Fishing Event in the World! Known as the “Friendly flyfishing championships”, it is an unparalleled opportunity to share a boat with some of the best anglers in the World. You can enter on Stocks on July ?? In association with the Sytner Group, the 2015 Lexus Individual Champion will win a brand new Lexus car for the coming year. There will be great prizes supplied by co-sponsors Greys and Minox at all of the regional heats throughout the UK. There is a unique “Wild Card” qualification at every Heat, where the captor of the biggest fish, regardless of individual placement in the match, will qualify for the Grand Final. All Heat Winners will become “Heat Champions” and win a special prize. At the Grand Final, the 14 Heat Champions will fish for the main prize of the Lexus Car, but will also fish against each other for the bonus prize of a superb fishing holiday*, courtesy of Anglers World Holidays! The Lexus Team Fly Fishing Championships are for Teams of 6 anglers and attract entries from as far away as Australia, Norway, Italy and Belgium. There is no need to belong to a recognised Club – simply get a group of 6 friends together and apply for one of the 6 Heats across the UK. There is no geographical restriction and Teams may enter any venue, but may only enter once. Teams will progress from their Regional Heats directly to the Grand Final, to be held at Chew Valley & Blagdon lakes . A total of 20 teams will compete at the Grand Final. This is one of the most enjoyable matches of the season. The competition is split into two 4hr sessions; the first will be fished from 9:30am to 1:15pm. There is a break for a buffet lunch, we then recommence fish at 2:15 and the match finishes at 6:00pm. There will be prizes for the 1st and 2nd places in each session and the overall winner across both sessions. It s a great day at this time of year the best tactics are usually dries or washing lining diawl bachs so it bodes well for a floating line match. The cost of entry is just £15 on top of your fishing fees and that includes your lunch and the chance to win some great prizes. One of the best things about this competition is that it’s two matches in one day and no individual angler can win more than one prize, so you have every chance of winning something. This is an individual boat fishing competition fished to international rules with catch and release after you complete your bag of four fish. Each returned fish will add 2lbs to your bag weight. It is generously prized and has a coveted trophy. In this popular competition, each pair fishes together from the same boat and works as a team to try and catch 10 trout. It’s as simple as that. Here is a brief outline of the rules: Pairs must fish from drifting boats but can use any flies that comply with everyday fishery rules. 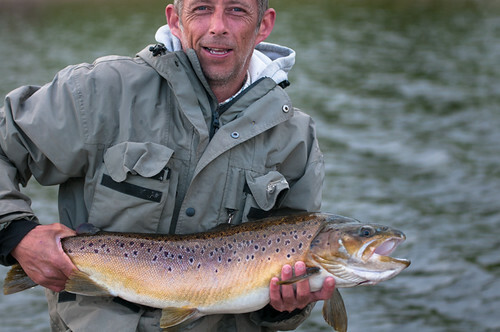 As soon as you have landed your 10th fish, head back to the lodge and hand over your bag. You will then be awarded a time bonus. (8oz for every complete 15 minute period left in the match). Any one trout cannot add more than 5lbs to your bag weight, but will count for the biggest fish prize. The competition will be fished between 9:30am and 5:30pm. Pairs must register by 8:45am. The entrance fee is just £22 per pair, so with your fishing and boat fees the total is £99/pair. This includes tagged fish entry. The top four pairs, plus the pair that catches the biggest fish will be in the prizes. There will be a generous cash sum for the winning pair. (The exact amount will depend on the number of entrants). There will also be tackle prizes for the pairs in 2nd & 3rd place and for the pair with the biggest fish. This competition is fished to fishery rules with regards to flies, but from drifting boats between. It will be fished between 10am and 5pm. The total fees of £45 includes: a full day two fish ticket, full day boat hire. £15 of your £45 will be put into a central ‘Stocks n Shares Pot’. Each fish caught wins you one share of the pot. E.g. If twenty anglers entered it would give a total Pot value of £300. If 30 fish were caught across the field then each fish you have taken or returned would be worth £10. If just one fish was caught across the field it would be worth £300 and so on. There will also be tackle prizes 1st and 2nd place. So the first two fish caught must be killed for a weigh in should there be a draw on numbers. This entry was posted in Stocks Reservoir Fishing Reports on January 10, 2016 by staff.